This post first appeared in the Spacing Vancouver Blog on February 18, 2013. Photo by Casey van Wensem. Last Wednesday my recycling didn’t get picked up. Wednesday is usually recycling day, but this time the truck didn’t show up. This happens fairly often. 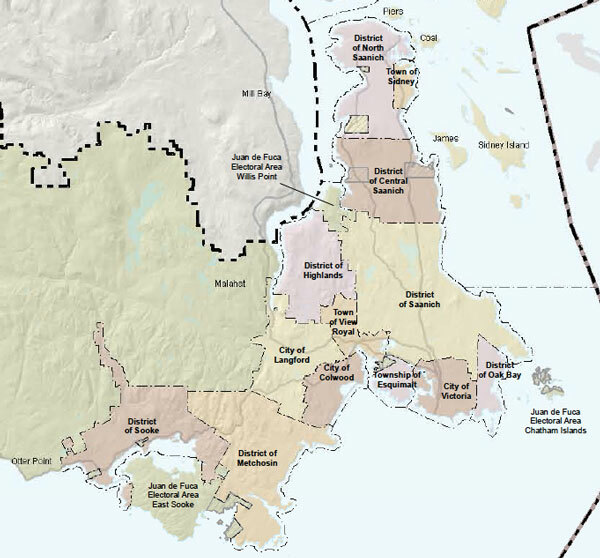 It’s a byproduct of living on the border between two Capital Regional District (CRD) municipalities: Oak Bay and Victoria. The line that divides the two municipalities runs right through the middle of my top-floor apartment, roughly dividing the guest bedroom from the rest of the suite. This means that responsibility for simple tasks like waste collection, as well as bigger issues like property taxes and bylaws, is shared and often convoluted. Victoria handles the recycling pickup, which means that sometimes mine gets picked up and sometimes it doesn’t. Capital Regional District (CRD) municipal boundary map. The same concept applies north of Victoria, where my parents live. Their home lies in the municipality of North Saanich, but is only accessible from a road that begins in Central Saanich. Last year, the District of Central Saanich decided to pave that road, and stopped right on the municipal border, leaving the last five hundred metres or so leading up to my parents’ driveway unpaved. And while much of the frustration with these boundaries comes from simple inconveniences such as these, the division of municipalities within the CRD also means that a district with a population of roughly 360,00 people has 13 different mayors and city councils, as well as a number of individual police and fire services. It also means that the urban planning in this relatively small region is often un-coordinated and unequal. Sometimes, these divisions can also be baffling. In the suburban municipality of Esquimalt, for example, residents can only keep a maximum four backyard chickens, while residents of the more urban City of Victoria can keep as many chickens as they like. And while I appreciate the possibility that I can keep unlimited chickens (on the Victoria side of my yard), I can’t help but worry that, in the event of a real emergency, the fire department might miss my house too. This entry was posted in Blog articles and tagged Landscape, Magazine, Spacing, Urban, Vancouver, Victoria. Bookmark the permalink.